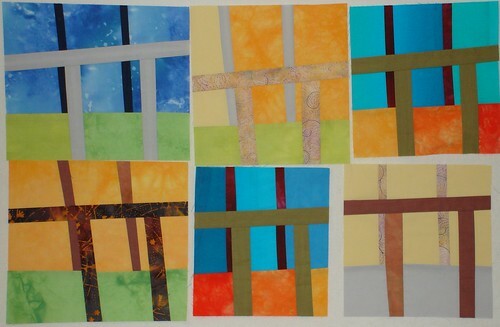 Here are the first six blocks pieced together. What I liked about making them was cutting the fabric free hand with the rotary cutter. The effect is that there's a bit of variety and movement added to the blocks. Looking at these six block I realized that I was moving away from my original colour scheme and that I was also spending more time on the project than I had originally intended or could afford. 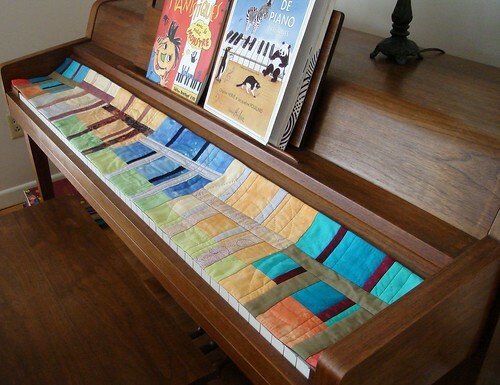 I had been wanting to make a quilted cover for our piano keyboard for quite some time. We have a small, apartment sized Yamaha with no keyboard cover built into it. Thus, the keys sometimes get quite dusty, (like when I haven't dusted for a while). When I laid the six blocks end to end, they fit the piano keyboard perfectly so I sewed them together end to end, like so. 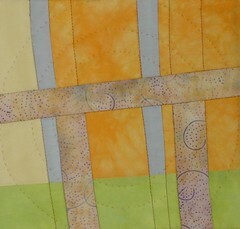 quilted and bound, et voila, a happy piano and April's TIF challenge completed. What a great piece. Love the way the colours change from the bass to the treble. What a unique piece, it turned out beautiful. We can always find another place to display our art! A wonderful case of serendipity in action! the key cover turned out wonderfully! A terrific result - I really enjoyed reading about the thinking behind this piece! this is perfect - looks wonderful, works beautifully - and what a huge transformation!